Brazilian filmmaker Dennison Ramalho has built a rep over the Fantasia International Film Festival’s history with his visceral, uncompromising short films LOVE FOR MOTHER ONLY (2003) and NINJAS (2011), and his scripting of the grisly Coffin Joe comeback film EMBODIMENT OF EVIL (2008). With his long-awaited feature directorial debut THE NIGHTSHIFTER, a world premiere at the current Fantasia, he solidifies his status as a serious talent on the international horror scene. Although it’s no less graphic in moments than his past work, THE NIGHTSHIFTER is generally more concerned with emotional violence than the physical kind. The bulk of the really nasty stuff occurs in the movie’s first third before giving way to pitch-dark, character-based/supernatural disturbance—a gambit that works so that a couple of moments of small-scale bodily injury in the final act have true squirmy impact. In fact, the serious gore involves people who are already dead, though that doesn’t stop them from communicating with the living protagonist. Ramalho and Claudia Jouvin’s script is based on Marco de Castro’s short story “Morto Não Fala” (also the film’s original Brazilian title), which translates to “The dead do not speak”—an ironic moniker under the circumstances. Stênio (Daniel de Oliveira) works in a São Paulo morgue, cutting open and stitching up cadavers, literally mopping blood off the floor, etc. It’s a morbid way to make a living, barely supporting his wife Odete (Fabiula Nascimento) and their two kids—though he’s a little more involved with his work than the average mortician, because he can converse with the corpses. It’s an ability he’s always had, and one that the film wisely doesn’t find it necessary to explain; it’s just a fact of Stênio’s existence. Among the dead folks who find their way to Stênio’s autopsy table are street gangsters who reveal their sins and secrets to him before Stênio sends them to their graves. When he learns of a betrayal in his own life, he makes the fateful decision to use information he’s gleaned from the stiffs about the local criminal underworld to take care of the problem. The scheme has unforeseen collateral damage, forcing Stênio to confront horror’s time-honored truth about messing with things he was not meant to know. 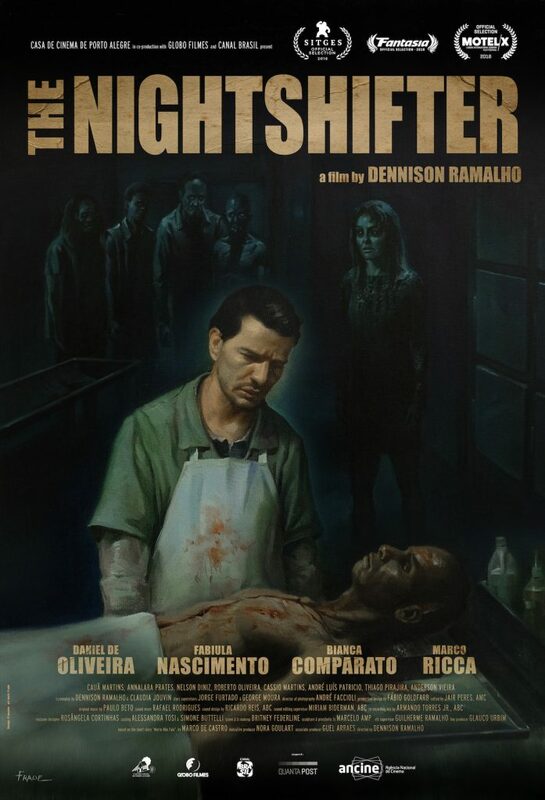 THE NIGHTSHIFTER also explores the genre’s classic themes of personal and family responsibility, while rooting them in a very specific milieu, atmospherically evoked by Ramalho, cinematographer André Faccioli and production designer Fábio Goldfarb. The lower-class streets of São Paulo and Stênio’s home, his death-tainted workplace and the graveyard his predicament leads him to become an overall environment in which it’s easy to believe the dead interact with the living. Within them, Ramalho stages some memorably horrific and eerie sights, creating just as strong a frisson with a few morgue drawers as he does with the body-slicing close-ups. For the latter, kudos to makeup and prosthetic effects artists Britney Federline and Marcelo Amp, whose work has a tactile plausibility crucial for the reality of the story around them. While the dead may be responsible for THE NIGHTSHIFTER’s punchier scares, it’s unnerving in a quieter way to watch Stênio’s personal descent, as his manipulation of knowledge acquired from the deceased puts him and his loved ones in fatal jeopardy. Though he cares for his family, Stênio in some ways is not a nice guy, and Ramalho and de Oliveira nonetheless succeed in keeping us involved with him as he struggles to extricate himself from the awful situation of his own making. Sympathetic support is provided by Bianca Comparato as Lara, a local young woman who tries to help Stênio without knowing what his real problems are. What she eventually learns, as Ramalho’s eerie and accomplished chiller comes to a close, is that the dead are much better seen and not heard.